The 2018 annual summary of the climate for the Southeast is now available online. It includes a summary of conditions across the region and a list of the top ten most extreme events. You can read it at http://www.sercc.com/climateinfo_files/monthly/southeast_monthly_report/southeast20181_12.pdf. 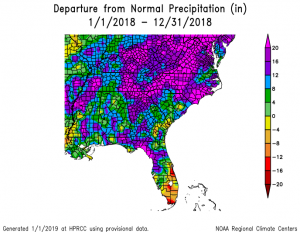 Note that listings of the ranking of 2018 compared to other years for the Southeast is not yet available from NOAA due to the government shutdown.